It's Facebook Fridays! for December 30, 2016, and we are helping folks wash their homes and businesses for the New Year! The Lucky Mojo Curio Company is holding a random drawing to give away 4 magnificent Floor Wash Special prizes that will cleanse your spaces for a lucky, safe, and prosperous 2017! This week all four fortunate winners will receive a complete Floor Wash Special cleansing kit with full instructions for use. 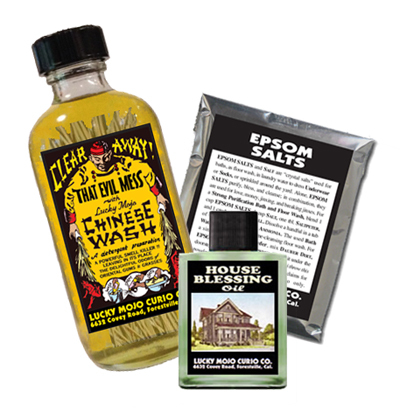 Each of these kits will contain a 4 ounce bottle of hand-made Lucky Mojo brand Chinese Wash, a packet of Epsom Salts, and a half-ounce bottle of House Blessing Oil. First thing tomorrow morning, we will select FOUR winners at random, announce their names here, and ask them to message this Facebook Page with their mailing addresses, so we can send them their FREE Floor Wash products. This is a cool prize pack! Be sure to go to our Facebook page and enter the free drawing. We have a winner! In fact, we have 4 lucky winners! Our Facebook Fridays! winners for December 30, 2013 are: Vickie Trancho, Phylicia Stubblefield, Melvina Spangler, and Nicole Pencola.